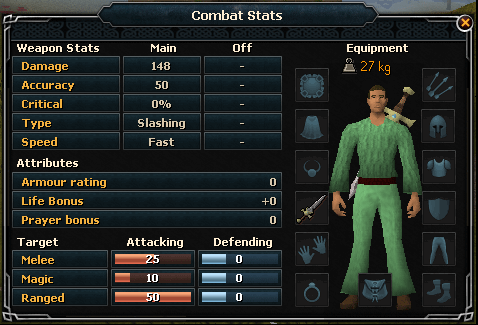 Denath, a follower of Zamorak, has stolen a book from the Monastery. This book is capable of summoning Delrith, an evil demon from another realm which will destroy Varrock if he is not stopped. Can you defeat this powerful demon and protect the city? 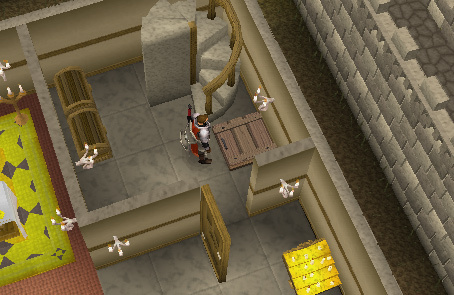 An evil follower of Zamorak known as Denath infiltrated the Monastery at Edgeville and made off with a book. This book is an ancient tome that was used to banish Delrith back to the demon plane, and is the only object capable of bringing Delrith back here! Find the only sword capable of weakening the demon and stop Denath before it's too late. Begin by speaking to the Gypsy in Varrock. 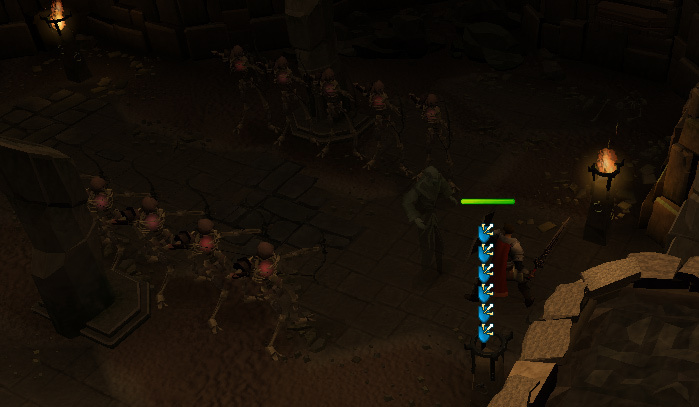 Skills: Ability to defeat 10 level 2 skeletons, 9 level 2 Zamorak monks, and a level 15 demon. 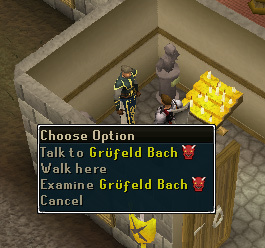 The quest can be started by speaking to Grüfeld Bach (no relation to Johann Sebastian Bach) at the Church in northern Varrock. He states that an evil Zamorakian wizard named Denath has infiltrated the monastery at Edgeville and stole a book of demonology. This book is the only object capable of bringing back a city destroying demon called Delrith back to RuneScape. The demon can only be defeated with a holy sword named Silverlight, which is kept in a crypt below the church. While Bach is tracking Denath, Bach asks you to retrieve the sword. The crypt entrance can be found in the northeastern part of the Church. Once in the crypt, walk north until you see three spirits (Spirit of the Body, Spirit of Faith, and Spirit of the Mind). Say that you have come to retrieve Silverlight and they will ask you to complete three trials. The Spirit of the Body can be found in the eastern part of the crypt. The Spirit of the Body asks you to "clean up the bones" to complete the trial. This seems easy, but suddenly the ten piles of bones turn into ten level 2 skeletons. The skeletons have 50 life points, attack with range, and are weak to stab. Once you have killed all of the skeletons, you have completed the trial. The Spirit of Faith can be found in the northern part of the crypt. To complete his trial, he asks you to cross the chasm. This seems impossible, but the spirit of faith asks you to have faith and to step into the chasm. From here the spirit will direct you where to go. If you try to step somewhere other than the area the spirit is telling you to step or overstep, your character will fall and end up at the beginning of the trial, with no life point loss. The path is always the same and is North, North, East, East, North, North, North, West, West, South, West, West, North, North, North. Once you get to the other side you have completed the trial. You will not fall into the chasm on your way back. 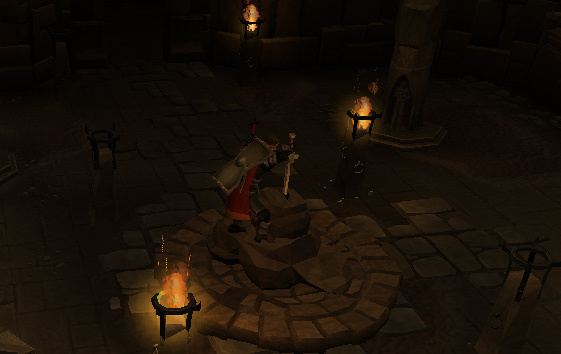 The Spirit of Mind can be found in the western part of the crypt. He will ask you several common sense questions. Why are you in this place? A sword that slays demons. Why do you require a sword that slays demons? 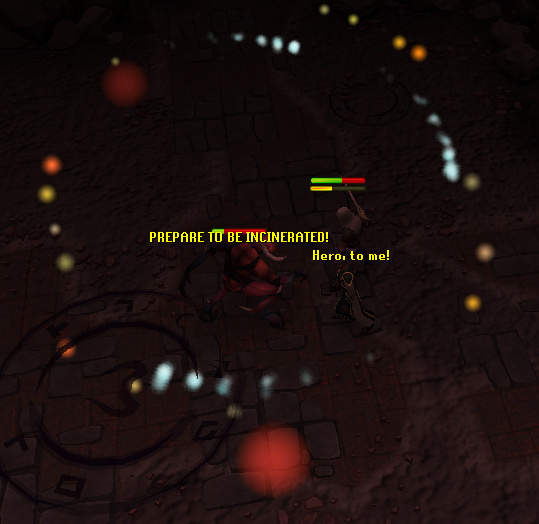 A powerful demon threatens Varrock. And who sends you to claim Silverlight and fight Delrith? After answering those questions you will have completed the trial. Once you have completed all of the trials, head back to the center of the crypt. The three spirits should be standing where they were originally standing. Talk to one and all three will congratulate you and remove the spell protecting Silverlight. Silverlight can be found stuck in a stone. In a totally original manner, your character valiantly draws Silverlight out of the stone. Now head back upstairs and talk to Bach. 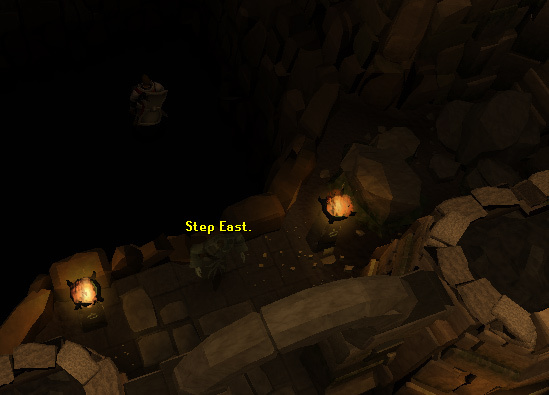 After telling him that you have reclaimed Silverlight, he will tell you that he has located Denath, who is planning on summoning Delrith below the unholy temple of Zamorak in Varrock. 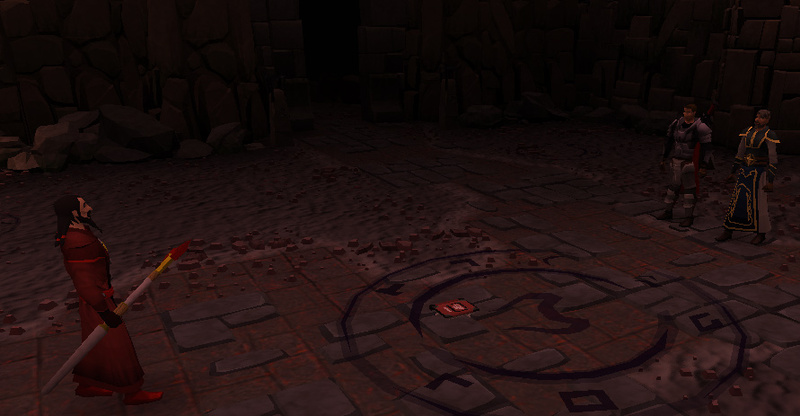 The Zamorak temple can be found in a shoddy building with a prayer altar in southeast Varrock. Climb down the trapdoor in the western part of the temple. Bach will greet you on arrival. 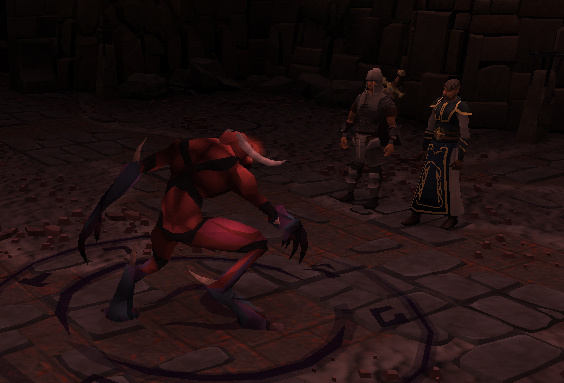 Head south and there will be two level 2 Monks of Zamorak. They attack with magic, have 100 lifepoints, and have no weaknesses. Bach will participate in the fighting but will afflict little damage. Once you have killed them, keep heading through the dungeon. You will encounter seven more monks throughout the dungeon, for a total of nine monks. Keep moving until you see a cutscene. You arrive just as Denath is about to summon the Delrith. Denath will summon Delrith and teleport away, leaving the two of you with Delrith. Delrith is level 15, but has a special magical attack that hits you with the majority (possibly all) of your lifepoints. Before using the attack, Delrith yells, "PREPARE TO BE INCINERATED!" To prevent total destruction, Bach will provide a force field to limit the damage, although Delrith will hit through it anyway and often inflict sizeable damage. However, you have to be in the force field to be protected from it. If you are not in the force field you will be hit with his strong special attack. 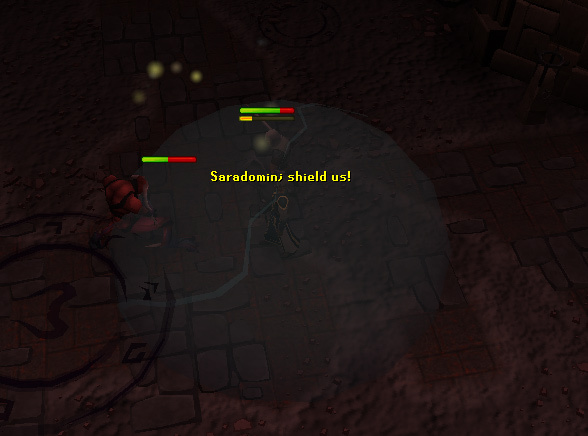 If you cannot get in the force field in time, try to use the protect from magic prayer if possible. Once you have defeated Delrith the catacomb will begin to shake. You and Bach escape and reappear at the quest starting point. Talk to Bach to finish the quest. The sword Silverlight is approximately equal to an iron longsword. 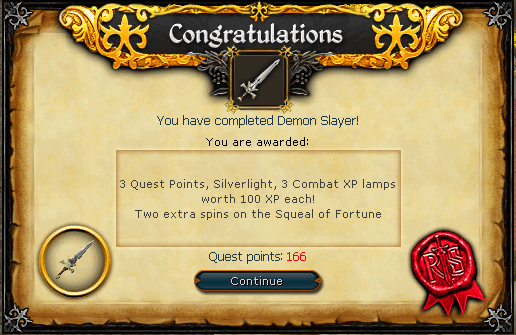 Previously, Silverlight was exceptionally good at killing demons. However, in the current combat system this does not appear to be the case. If lost, Silverlight can be retrieved by speaking to Grüfeld Bach at the Varrock Church.